So how many people attended this year’s Rally and March for Life in Washington that marks the anniversary of the 1973 Roe v. Wade Supreme Court decision that legalized abortion throughout the country? That’s impossible to say, but try to imagine a huge throng marching 10-15 abreast taking more than two hours to cross a given point. We do know there were at least 5,000 from parishes and schools of the Philadelphia Archdiocese, according to estimates by the archdiocesan Respect Life Office. 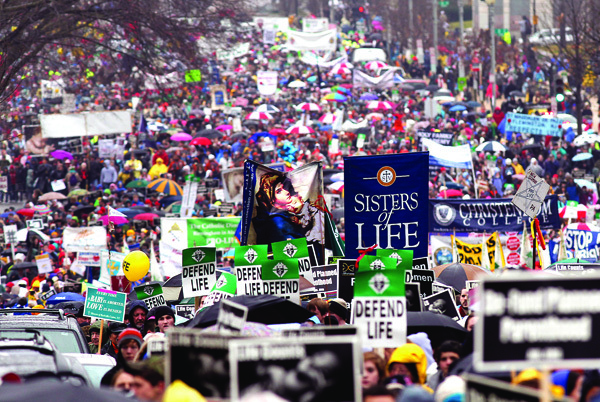 As a practical matter, many of the Philadelphians do not arrive in time for the 10 a.m. Mass, but nevertheless Stephen Bozza, director of the archdiocesan Respect Life Office, estimated there were 2,600 Philadelphians at the Archbishop’s Mass. “It’s amazing to see all these people on fire for life,” he said. This year’s March was held Monday, Jan. 23, rather than the traditional date of Jan. 22, because Washington shuts down over the weekend. For Philadelphians, who mostly arrived by bus, the day began with a 10 a.m. Mass celebrated for them by Archbishop Charles Chaput at the Basilica of the National Shrine of the Immaculate Conception, where most of the local buses parked. The main event Sunday evening was the opening Mass for the Vigil for Life, also held at the Basilica, with Cardinal Daniel DiNardo of Galveston-Houston, and current chairman of the USCCB Secretariat for Pro-Life Activities as principal celebrant. He was joined in concelebration by cardinals, archbishops, bishops and hundreds of priests in Washington for the observance. This is easily the largest event of the year at the Basilica; Msgr. Walter Rossi, rector of the Shrine, estimated there were 10,000 either in the upper church or attending through closed circuit television in the lower level and another 10,000 would attend the series of Masses, including the Philadelphia Mass, the following morning. Many of those who come have been doing so for years. Helen Howe of Queen of the Universe Parish in Levittown estimated this was her seventh time. “I come for life in the womb and the babies, we have to defend them,” she said. As always, the March was preceded by a rally on the National Mall with House Speaker John Boehner leading off a string of pro-life officials and others in brief speeches. As a practical matter, many if not most of the marchers do not attend the rally because of space limitations, but join the March on Constitution Avenue past the Capitol Building and ending before the Supreme Court. The Philadelphia delegation mostly met on Constitution Avenue, and they were led by St. Charles Borromeo seminarians. Weather for the March, which is always held in the heart of winter, is rarely good, and this year it was rain, not snow. “Our seminarians are just so convinced of life and recognize it as a gift of God, that is why they come, whether it’s sun, rain or snow, they’ll be here,” said seminary rector Father Shaun Mahoney. Adam Shanosky, down with a group from Bishop Shanahan High School, was keeping dry under a Phillies umbrella. One of the larger parish groups had two busloads from St. Katharine of Siena in Wayne. “We have about 90 people, and we are here to celebrate life,” said Jack Graham, a leader of the group. That’s pretty much the sentiment of every group whether it was three busloads or a half dozen. Catholic Philadelphians truly celebrate life.